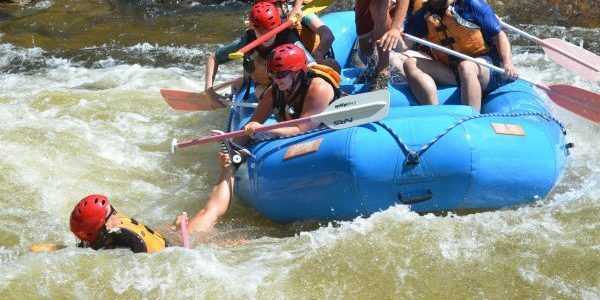 If you fall out of an inflatable white water raft during a whitewater rafting trip, there are several things to remember in order to be safe. The overall key to getting back in the raft safely is to stay calm and not panic. Clear thinking will help you get back in the raft much quicker. Remember what you were taught in the pre-raft trip river safety briefing and apply those ideas quickly. When you first fall out of the whitewater raft, quickly grab for the side of the raft and, if there is one, grab the safety rope that runs along the outside of the raft. Hold the rope until a rafter or your raft guide comes to pull you up into the raft. When being pulled into the raft, face the raft and rescuer and be pulled up face first. This is important because raft rescue in this position allows you to bend forward at the waist as you come over the side of the raft. It also allows you to see your rescuer working and you can help them by grabbing something like ropes in the raft to help pull yourself in. It is also easier to kick the water in this position to help you back in the raft. If you come in facing away from the raft and your rescuer, your back will arch awkwardly and you will be little help in terms of pulling or kicking. Next, and possibly most important, you must immediately raise your legs toward the surface of the water. The riverbed below you is much more dangerous to you than the waves around you – the rocks at the bottom of the river may have irregular shapes and crevices that can entrap your feet if they are near the bottom. Raise your feet immediately to the surface – toes out of the water to be sure. Think of the rhyming phrase “nose and toes” – if your nose and toes are above the river surface, you are getting air to breathe and your feet are above the rocks and avoiding possible entrapment. This position of feet up and feet facing downstream is the most important part of the “defensive swimming” or “whitewater floating” position. If you are swept away from the white water raft and cannot reach it, use your hands to turn your body so that your feet are facing downstream and you can see where you are floating. Always float on your back with your face out of the water. All the while, keep your feet at or above the surface of the water. Keep your arms out to the side to help slow down and maneuver in the river. Be aware of your position in relation to the raft. If you are within a few feet, a paddle may be extended for you to grab. Grab it and then get pulled alongside the raft. Then face the raft and wait to be pulled up. If you further away, but are within 75 feet, expect a rescue rope to be thrown to you from the river raft. If this happens, grab the rope and put it over your shoulder. As the rope is pulled in, face away from the whitewater raft and stay on your back. It is a mistake to get pulled in on your stomach, watching the rescuer. If you do this, water may be forced into your mouth as you are pulled toward the raft. If you are swept far from the whitewater raft, further than rope distance (75 feet) – remain calm and in your white water floating position. Whitewater rapids are formed when the riverbed drops or goes downhill. Every river rapid will end when the riverbed flattens. If you are in the rapids long enough, calm sections at the bottom or side of the rapid will give you a chance to work yourself to the side of the river. Take advantage of these breaks – if it is a short section of calm water, flip over on your stomach and swim aggressively towards shore. Do not stand up until you are in very shallow water. If you reach a long calm stretch, stay on your back and work your way to shore with your arms or flip over and swim. Again, do not stand up until reaching very shallow water. When you reach shore, stay in that location and wait for rescuers to come to you. Signal that you are “OK”, but need to be picked up. Deerfield River guide since 1990, Millers River guide since 1991, Kennebec River guide since 1991, Dead River guide since 1991, West River guide since 1991.